Home » Website Building » WordPress » How to Move Live WordPress Site to Localhost? How to Move Live WordPress Site to Localhost? There are applications like MAMP and WAMP used to create a local server environment. This helps to install packages like WordPress so that developers and site owners can build their site in local PC or Mac. Once the local site is ready, it can be easily moved to the live server. But over the period of time your live site may have lot of deviations compared to the localhost site. At this point you may want to sync the live site’s content to local site so that you can test plugins / themes/ WordPress version updates on a local site before updating on a live site. 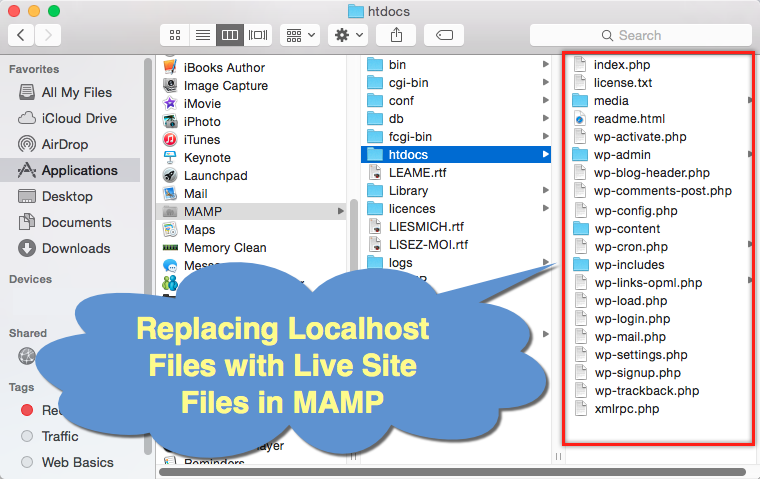 Though there are plugins which can speedup the backup process, in this article we explain how to manually move live WordPress site to localhost environment. This article explains the process of moving a live content to localhost. If you are looking for setting up local WordPress site then read our separate article on how to install WordPress on your Mac using MAMP. Use FTP client and download all your live WordPress site files, generally available under “/public_html” folder. Login to your hosting account cPanel and export live site’s database from phpMyAdmin section. Login to phpMyAdmin of your localhost using the application you used to install WordPress locally and create a new database. Import live database file downloaded in step 2 to localhost server. Run query to replace all occurrences of live site’s URL with the localhost URL. Replace localhost site’s files with the live site’s files from step 1. 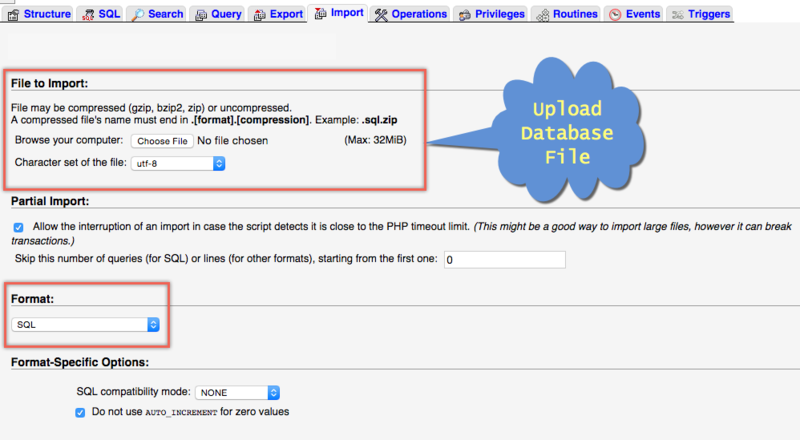 Edit “wp-config.php” file and change the database name to new database name as created in step 3. View localhost site and login to localhost WordPress admin dashboard to see all live site’s content is available. Launch FTP client like FileZilla, connect to your hosting server and download all WordPress files of a live site to local computer. Generally files will be available under “/public_html” folder unless you changed it to another directory during WordPress installation. The entire download may take a while based on the size of your site. Hence we recommend to do this step first so that you can do further steps in parallel. In FileZilla first choose local site’s location where you want save the files. Under remote site section, select the files and choose “Download” option by right clicking. This will download all selected files to your local computer. 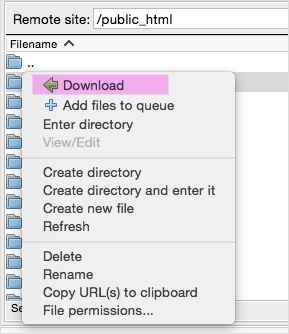 Read our article on how to configure FileZilla, setting up FTP account in Bluehost and connect FileZilla to Bluehost FTP server account. The next step is to download the SQL database file of your live site. Login to your hosting account and go to the cPanel. Click on the phpMyAdmin icon and login to your phpMyAdmin section. 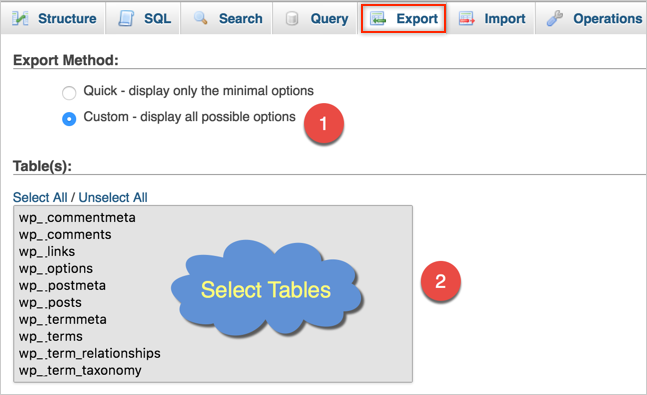 Select the correct database and click on the “Export” option. Choose “Custom – display all possible options” as “Export Method”. Select all database tables (you can ignore the tables which you don’t want to export by deselecting them). Select output compression as “zipped” or “gzipped”. Click on “Go” button at the bottom to download the SQL database file in a compressed format to your local computer. 1. We recommend export the database by ignoring security and caching plugin tables. These plugins may cause problems while uploading it in the local environment. In most cases, these types of plugins are not required in local environment or you can export the plugin settings from live site and import it on your local site after reinstalling the plugins. Similar to step 2, login to phpMyAdmin section of your localhost with the URL “http://localhost/phpmyadmin/” and create a new database with the same name as live site’s database. Now select the newly created database and then click on the “Import” option. Choose the live site’s database downloaded in step 2 and upload to local server. Now that you have uploaded live site’s database to local server but the tables will still have live site’s URL references instead of localhost which you need to change it. Copy the below query and replace the site name with your own URL. Go to the phpMyAdmin section of your localhost site and select the database. 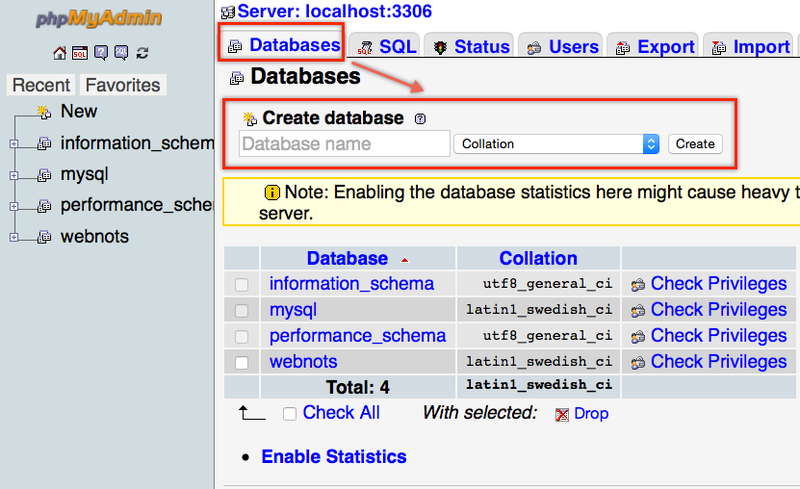 Click on the “SQL” tab and paste the query in the box. If you see the “Simulate query” button, click on it to see whether the query will replace the URLs. Sometime you will not see the “Simulate query” button. Just click on “Go” button to run the query to replace live site URL with localhost URL. You will see the result indicating how many lines are changed in the tables after the successful execution of the query. Next step is to replace local site’s files with the live site’s files downloaded in step 1. The simple way to avoid mistakes here is to change the existing local folder name with the suffix “_old” and then create a new folder with the same name. Paste all live site’s files inside the new folder. If you open your localhost site now it will probably show the message “Error establishing database connection”. 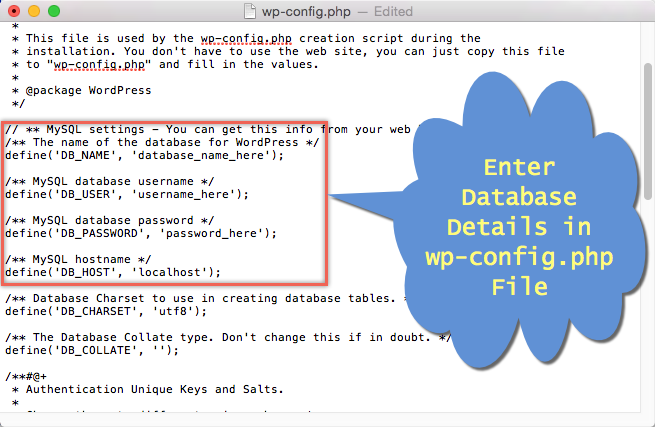 Locate and open “wp-config.php” file in local server and replace the database name with the correct name as you created in step 3. Generally the username and password are same as “root” (unless you changed it) and change it accordingly. Login to localhost WordPress admin dashboard and check the settings. The sidebar widgets will not be imported from the live site. So you should manually add the sidebar widgets in localhost site. Plugins having single domain license key may not work on the local site as it is validated with the live site. Some of the plugins like caching and security plugins may not work in local environment. Either they will be automatically deactivated or you should manually deactivate for the localhost site to work properly. If you have the absolute URLs used on footer and menu items then you may need to manually change them to local site URLs. I created a subfolder named localwordpress under httdocs, then placed all of the WordPress files under this folder. I went to localhost/localwordpressI, but I got a Page Not Found error. What should I do? Guess I shouldn’t have attempted this when I didn’t learn about php and mysql properly. Am I correct to understand that if I follow the procedure above, I will be able to update my website on my PC and then upload it on the webserver each time? Or do I have to following the same procedure everytime that I want to update the website? Firstly, thank you for putting out this article. I’m stuck at ‘Step 5’. Will you please help me with this. I get the error “#1146 – Table ‘uberkarm_wp.wp_options’ doesn’t exist”. I’ve tried for a few hours now to play around with things, search the internet, and even delete and reinstall my test wordpress site, but still haven’t been able to find a solution. I’m using SiteGround and CyberDuck. If you have changed the table prefix from wp_ to anything else then you should use that prefix in the SQL query to replace the URLs. Thank you! I got it to work. I ran into another problem. I finished all the steps and when I check the local site the WordPress theme appears, but without content. I am then redirected to the online site when I click on any other pages. When I ran the SQL query it only found 6 things to change. I made sure the ‘wp_’ was correct. This is a very basic WP site I created to learn how to transfer it over to a local host. It only has a few pages and a few pictures (99 mb). Thank you very much for the detailed tutorial, it worked like a charm. Thanks for this. I did all the steps (a couple times) and can see the site but it will not let me log in. I checked the user name and password a couple of times. And when I fire a reset password, I do not receive an email. You can’t reset password in localhost as the local server by default can’t handle PHP email functions. Go to phpMyAdmin section of your localhost site and reset the admin password by looking the admin id in “wp_uers” table. You can change the password under “user_pass” field and select the function as MD5 from the dropdown. Click Go button to save your changes and try to login to localhost site with the new password. I wanted to have a replica of my live site on one of my test domain/subdomain i have and I have used this blog few days before and did all the steps perfectly and it worked fine. Now i want to have same site replica on another subdomain, and i did all the steps again and all is ok. But when i try to access the wp dashboard to make few changes, i am getting the url as page not found. I am not able to see the wp login page to access. If one case worked fine, another case also should work from the steps perspective. Check the installed plugins and deactivate all plugins and try to login. You can change the plugin’s folder name to “old_xxxx” to deactivate. Your tutorial is great.But the thing is i did all the steps correctly.And i can login to the admin dashboard and also i can visit the home page but from there if i want to go to next page it goes to the live page(server page) and not the local page…i did change the links in wp-options and wp-posts and wp-postmeta…i did all the updates but from the home pages it goes to the live page address…. If the database is updated with localhost URL then no possibility it can go to live site. If you are using absolute URL in sidebar/footer widgets then it will be linked to live site. You should change the widget content on localhost. Is it not just fine to skip step 1 until the database have been set-up and then download all the live repo? Or perhaps just download it on step 1 and leave it like that for database connection? The reason is clearly mentioned in step 1 – downloading the entire site with FTP will take many many hours depending upon the size. If you have very small site with few images then you can do it later. if my live site has SSL certificate, can i still shift it locally using mamp or must i upgrade to mamp pro for localhost to load the SSL? Or can i load the live ssl site without https on my localhost? If you want to use https on localhost then you should use self signed certificate. But this is a tedious process to setup and modify the Apache configuration file. You can check out this article for more details. For http access, you should replace all the occurrences of the live site with http://localhost as explained in the article. The requested URL /jymusic/about/ was not found on this server. I can’t figure out why this is happening? Same here… Anyone can help? I have the same problem, I change the permalink settings, from “Custom Structure” to “Post Name”. It’s solve the problem. Changing permalink settings and reset back is the simple solution that will create the entries in .htaccess file for the links to work properly. Hi, I do all 5 step. I renamed my file .htaccess for something else. I saw my first page (Shop), and I can acces in the admin(everthing is there, I saw all my content pages and products in both languages FR/EN). But when I want to click to see other page from my menu. I can’t access. I saw the url is the localhost ex: (localhost/styly.ca/temoignages/). But I can’t access. I feel I’m so close. Sorry for my mistake in english. Is there a part that I forgot to do? The localhost URL you mentioned is not correct, you can’t have two domain names in the URL. The localhost should replace your domain name style.ca and the correct URL should be “localhost/temoignages/”. Probably on step 5, you have done the replacements of site URLs in “wp_options” correctly (this allows you to login to localhost). But you might have done “wp_posts” with wrong replacement which leads to wrong URLs in the content. Oh it’s not all 5 but all the step I do correctly. It’s not a problem from my domain localhost/styly.ca. I asked a friend to help me. He send me this link. http://www.anmsaiful.net/blog/php/enable-apache-rewrite-module.html, and after everything worked. And I went to parameter / setting and save the permalink. My problem is solve. Thank for the reply. I tried going to /wp-admin/ to log in in the case it was a plugin i needed to activate but this 404’d. First you can go to the document root and change the name of plugins to disable them (looks you are using some plugin to show the content). Ensure you have done step 5 correctly to replace the site URL with localhost then you should be able to login to localhost. Hi, i did follow your steps. But still it did not work. Then i edit [wp_option] in phpmyadmin wordpress database, there i changed the URL to localhost it worked!!. But thank you for your help too!! This is step 5 – replace all live site URLs with localhost. Hi and thnx for your great tutorial. Thanks for reading. Based on the screenshot you are trying to open a page “localhost/wordpress” and getting “404 page not found” error. Your localhost site homepage should be just “http://localhost” (without “/wordpress”). If you have done the database / files import correctly then it should work fine. Login to the localhost admin panel and check required theme and plugins are active. PS: the screenshots you attached were deleted as it was showing the database details. Where you say to “Replace Live Site URL with Localhost URL” I’m not following. I’ve cut and pasted the Update code into my SQL section within my database, but I am not sure what to do from here? What is my LocalHost URL?? The name of the database after localhost? EG http://localhost/“nameofmydatabase”? You need to replace “http://www.yoursitename.com” with your live site URL. In general the localhost URL should be “http://localhost” as mentioned in the query. But it depends on your configuration and can also be like “http://localhost:8080”. Great post. Worked beautifully for me. Thanks for the inputs, it should definitely help for those having larger DB file. You should have created a database with the same name as your live site’s database and then imported the live database before running this query. I am now getting a 500 error that I assume has to do with this…please advise. 1. At first it didn’t work, then I found out that I had to remove my htaccess-file first, originating from my live host – or else localhost wouldn’t show anything! 2. On one of my websites (www.zlight.dk) everything works properly in localhost – until I press one of the menu buttons which points to a live link. And suddenly I’m on my live site, which kinda confuses me, but I guess that’s what it is. 3. On my other website (www.osleder.dk) I’m not even allowed to ‘stay’ in localhost – it immediately jumps to my live site, when I write “localhost” in my browser. That is, I’m immediately directed to http://www.osleder.dk. How do I get around these issues? 1. At least in Mac with MAMP still .htaccess file is needed especially if permalink is used, otherwise all pages are showing 404 not found. But we also noticed in WAMP, .htaccess file needs to be deleted as you mentioned. 2. Please check you have any plugins creating separate tables. In step 5, only three tables (wp_posts, wp_options, wp_postmeta) are redirected to a live site, if there are links in other tables then still it will be pointing to a live site. 3. This means the site URL is still pointing to live site in “wp_options” table. Check you have done step 5 – replacing the live site’s URL with localhost URL. Please, how can one resolve the second(2) point, after locating the plugins creating separate tables? Go to phpMyAdmin and select the database to see all tables available. If the table is created by a plugin you can identify with the name (for example if Woocommerce is the plugin then the table name will contain the word “woocommerce”). Use similar query as mentioned in step 5 to replace the site URL to localhost URL. Ensure you have configured the ports correctly in the local environment. This could be the reason for the error. This is very useful and now i backed up my whole site locally without any plugin.